MMCart for Joomla is a software extension that permits small, medium and large publishers to sell secure streaming video and audio (HLS, MPEG-DASH, Flash, etc. ), from a low-cost shared hosting account. MMCar also sells images, PDF, video chat, online games, apps, lessons & exams, external sites and live events. Powered by PHP and AJAX technology, integrated with Open Source and commercial transcoders, media servers and media players, MMCart provides publishers with tools for every aspect of their streaming operation, on both Linux and Windows servers. Our Joomla version is currently available, and our Wordpress version will be released prior to 2018. MMCart permits customers to preview, purchase, and view purchased content - anytime they are logged into their account. They can also rent, subscribe, and gift products. It is iOS and mobile-friendly, PCI compliant, also allows shop owners to sell merchandise in addition to media. Live and on-demand streams can be protected with Simple DRM Plus TM, developed by MediaGration to guard against unauthorized access, viewing, sharing, downloading or copying. Supports all languages, currencies, shipping methods and providers, and PayPal and Authorize.net payment methods. MMCart integrates and gives API control to the most popular media players (JW Player, Video JW, Bit Movin'), and media servers (Evostream, Wowza, WMSPanel). It connects one local media server, and an unlimited number of remote media servers and media sources, to your viewers, automatically, through their previewed or purchased products. MMCart provides everything you need to upload, prepare, publish, manage and sell on-demand and live video on the Web. Publishers can sell site passes, program subscriptions, or apply pay per view, pay per minute, pay per play and pay per download billing. MMCart is the world's only plug-n-play, end-to-end OTT solution, for the sale of OTT content. 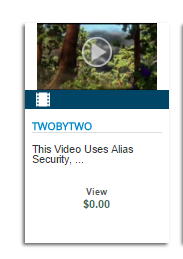 It is extremely affordable and can be scaled to support from a few to millions of users and views. Shops using MMCart can also sell shippable merchandise. MMCart turns a Joomla site into a powerful box-office, like NetFlix, Blockbuster or Amazon Prime. MMCart supports ABR HLS (HLS v4); a format that can stream to all devices. MMCart also supports MPEG-DASH, RTMP and other streaming protocols No other pay per view software gives publishers more features, billing and packaging options, integrated players, media servers, and readers. All MMCart Web sites require AJAX eShop, required plugins, add-ons, Linux, Curl, FFmpeg and sufficient bandwidth, memory, and storage to support both Web and media service. Bulk Media Uploader & Product Creator automatically creates media products for live or on-demand videos, audio, images, pdf, merchandise. 15-year track record as the most comprehensive and powerful PPV, PPM and subscription solution for CMS frameworks. 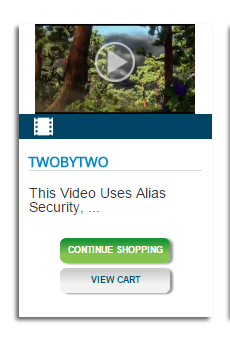 Customers can preview and purchase any media item from a list page or a product page. Note: JW Player is the most-used and fastest loading video player on the web. The new version is their fastest, lightest and smartest player yet. It boasts some impressive features such as MPEG-DASH support, a CSS skinning model for easy customization and full IMA 3.0 support for HTML5. The myMedia page (shown below) displays every customer's active subscriptions and lets them know how many sessions or days remain. It can be named anything the publisher wants, such as "myBooks" or "myMusic", etc. 2)Review the file list, specify the specific name, price, description, category, etc. That is all there is to it! You can publish hundreds of videos, songs, images, ebooks, or shipped products, in a matter of minutes. 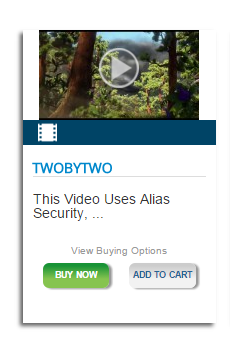 Users can then browse and purchase videos or other media, and view it immediately, or anytime later when they log in. With our security plugins, MMCart is capable of implementing Simple DRM Plus. Simple DRM Plus (TM) is a plug-in-play implementation of Apple's widely accepted HLSe, combined with proven authentication and content protection technologies. Simple DRM Plus is a technology and practice, developed by MediaGration; combining multiple standards-based security technologies, with best practices, to achieve exceptionally strong protection for video and audio content. MediaGration currently has plugins for Joomla. A Wordpress plugin set is scheduled soon, along with a generic Simple DRM Plus (TM) Toolkit (TM) for stand-alone Web sites and application developers. 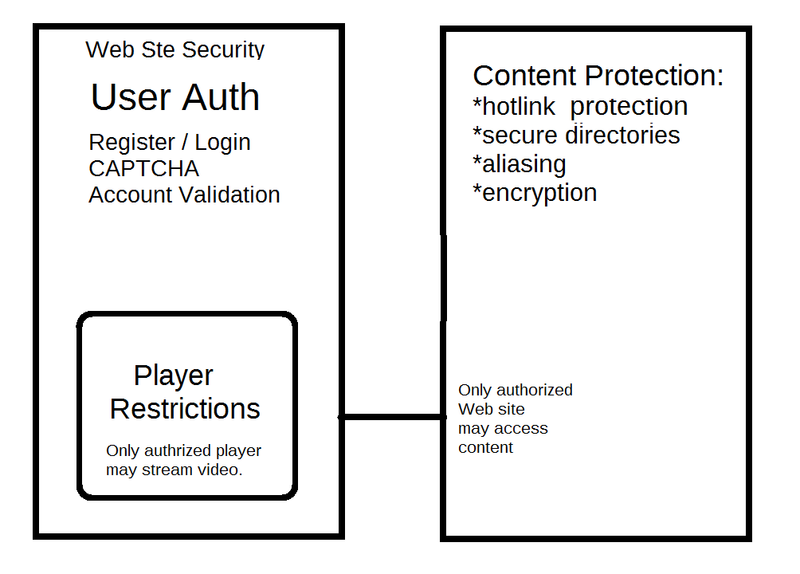 CAPTCHA-powered user-authentication - human "character"
By implementing the above standards-based technologies, publishers achieve the maximum security against compromise and unauthorized sharing. In addition to the above security technologies, two servers are required - a Web server and separate media server. Only the co-located Web server (or authorized remote Web server), has access to content. MediaGration is working with industry partners, customers and IT security firms to test the strength of Simple DRM Plus, compared to other video and audio security technologies, including conventional DRM. Some are suggesting that because it is strong enough to prevent any low-budget attempt to violate it, it can deliver more than enough security for live and recorded video and music. MediaGration will be publishing more information about Simple DRM Plus, and also certifying sites that meet the minimum requirements of a Simple DRM Plus Site (TM). All sites installed by MediaGration receive certification. Other sites require an audit by MediaGration. All certified Web sites display a live graphic certificate (with links to their certification profile), verifying that they have passed our certification test.